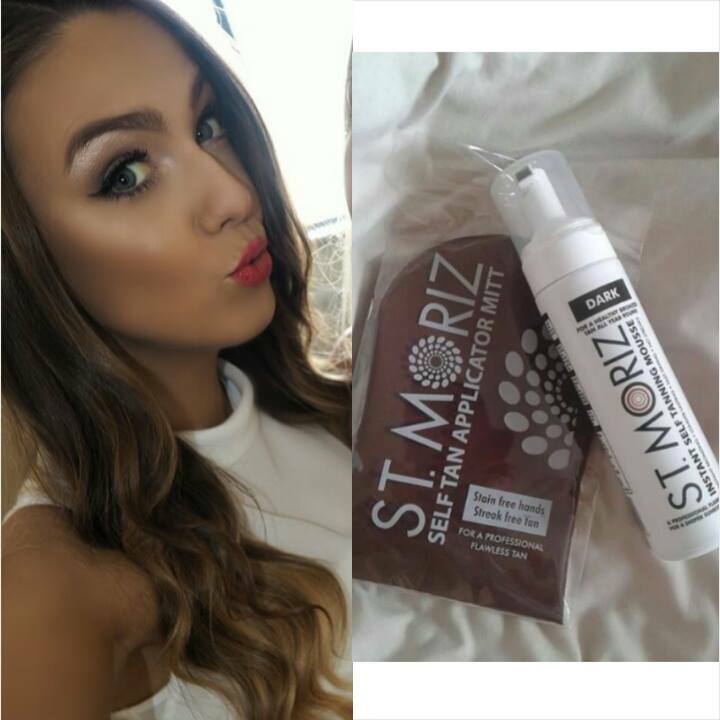 Hey ladies, So I have finally got round to writing my review on the ST. MORIZ Tan. I wanted to give it a few days to let you know how it lasted and faded. After trying and loving the SUN KISSED TAN MOUSSE from penneys I thought I would pick this one up and give it a try aswell. I was excited to try it after posting the picture of it on Facebook as alot of you said you loved it. My first impressions when pumping it onto the mitt was that it was alot darker than the “Sun Kissed tan” that I reviewed a few weeks ago. I personally didn’t think the “Sun Kissed mousse was orangey but compaired to the ST. MOTIZ it is. I applied it Sunday morning and it has lasted great. It’s fading nicely and hasn’t become patchy like some tans can. The active ingredients work as soon as they hit your skin allowing you to apply it and head out the door (great for a night out that wasn’t planned) The residue just washes off in the shower after 6-8 hours or perferably the next day leaving you with a fab tan that will last for a good week. I didn’t find it sticky at all. As soon as it was properly rubbed into the skin it was dry. Because it dries so quick you need to move quick when appying it. My top tip when applying this tan or the sun kissed tan is to use 2 pumps of the mousse into the mitt and apply it in circular motions to the bottom half of your arm first (from rist to elbow) instead of trying to rub it all over your arm at once (because this will cause the tan to dry too quickly you will miss parts and your tan will be patchy/streaky. Prefect small areas at a time until your happy then move on. I am so glad they have finally made tans that smell great this one smells like baby powder. Price wise its only €4.50 which it nothing when it comes to the world of tan. Comparing it to the sun kissed tan they are very similar. If I had to choose which one I preferred I would say the ST. MORIZ only because when compared I found the colour was good and dark and I like a good dark tan. Both the “sun kissed tan and St. Moriz tans are available from penneys stores nationwide and also are available in a medium shade. If you havn’t tried eather one give them ago they are fab and you can’t go wrong with the price.